Brue Valley Rotary Club successfully revived an ancient tradition and, in doing so, raised the grand sum of £850 for Wincanton Community Hospital. Over a hundred people gathered in Yarlington on January 17th, the old Twelfth Night, to drive away the evil spirits from a local apple orchard and to encourage the trees to produce a plentiful harvest. 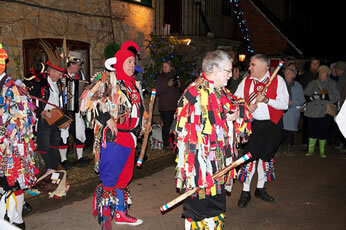 The evening began with music and dancing provided by the Wyvern Jubilee Morris Men outside the Stag's Head. 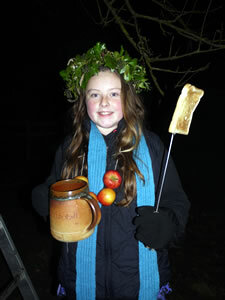 The Wassail Queen, eleven year old Georgie Moore, together with the Morris Men, then led the assembled group to the nearby orchard of David and Jane Braybon where mulled cider or apple juice was served to all. Alan Stone, a local historian and a knowledgeable authority on cider apples and cider-making, set the scene by informing us all about the history and purpose of wassailing. 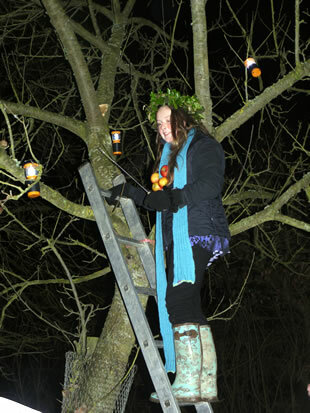 Cidersoaked toast was then hung in the branches of the oldest and most prolific tree in the orchard by the Wassail Queen as an offering to the birds, who are the guardian spirits of apple trees. Cider was poured around its roots. 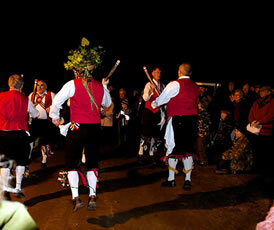 Led by the music from the Morris Men, the Yarlington Wassail song was loudly sung. Guns were fired into the air and spectators were then encouraged to make as much noise as possible by banging drums, pots, pans, dustbin lids and by blowing horns to driveaway the evil spirits. Returning to the Stag's Head, many guests enjoyed a delicious dinner with an apple based theme, expertly cooked by Paul, the landlord. The Wyvern Jubilee Morris Men continued to entertain those assembled in the restaurant with their unique brand of music, dancing and play-making. Proceeds from the raffle, the wonderful generosity of the Stag's Head and other donations enabled the Brue Valley Rotary Club to raise the magnificent total of £850, which will be donated to Wincanton Community Hospital for their scanner appeal. An excellent evening's entertainment was enjoyed by all and it is hoped that this ancient custom will be repeated next year. If you missed this in January 2012, its not too late. We are wassailing again on 17th January 2013. We will again be having the traditonal wassailing ceremony at Yarlington(dont forget to bring something noisy to frighten away the evil spirits). 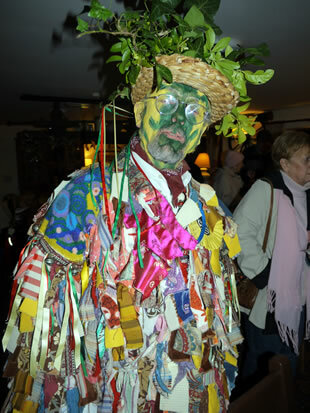 And afterwards you can warm up with a drink or an apple themed meal at the Stags Head (2 courses for £10) and be entertained with a Mummers Play performed by the Wessex Morris Men. We meet at the Stags Head at 7pm so do come along and join us at this free event and share an evening of fun in darkest January. There will be a raffle in aid of the scanner fund at Wincanton Hospital.